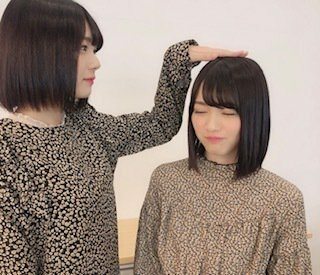 Discussion in 'Keyakizaka46 Members' started by ForrestFuller, Dec 4, 2018. 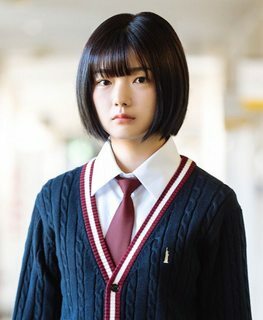 She looks like a more prettier version of Ozeki. (*with the song lyric 'Sanpo' from film 'Tonari no Totoro'*) Karin~ Karin~ Taberu no daisuki (i love to eat)~ Shabu shabu daisuki (i love Shabu shabu)~ Yakiniku mo suki (and also love Yakiniku) ~ Tapioka ~ 1-nichi 2-tsu nomu ( 2 times daily drink)~ Komiete Karin (even though karin look like this) ~ Egao ga nigatedesu (i dont know how to smile)~ Ato nigatena no wa yaki nasu (i didnt like roast eggplant)~. 66-ban Roro-chan ko to Fujiyoshi Karin deshita. Min'na oenshitena ~ (No.66, Roro-chan, thats me Fujiyoshi Karin Yoroshiku onegaishimasu).! Attempts made at the audition: I learned to sing with my high school teacher. Describe yourself with 1 words: The eater. The thing to be grateful for in life: Born as a human, so you can eat anything. The moment i saw her photo for the first time i know this girl is something. .She really caught my interest she look different from the others girls.. According with BUBKA magazine website. Karin-chan got the attention of BUBKA's staff present on the "Omitatekai" event. I consult with some friends, and they told me that the "Omitatekai" report in BUBKA has a extensive report about her and was called as "the most talented girl among the new members". i hope see more smile from karin. Since these days you can watch movies from home she doesn't feel like going out. Plus watching from home is comfortable right? 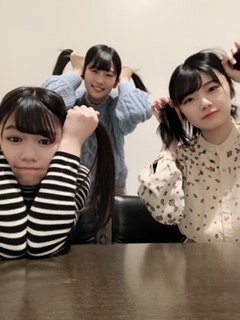 "I asked Yui which one of my selfie should i post but i posted both anyway"
She cut her hair in the middle of the audition and her family disapprove of it. But she cut it because she think it's easier to dance without it, and she indeed feels easier when practicing after cutting it. "In photographs i tend to appear unfriendly, but deep in my heart i am actually having a lot of fun. It's hard to show it on my face..."
"There is no way i could ever forget that scenery i saw in Budokan. My goal is to become a person that is needed by someone else. I hope to achieve that goal in my activities as Keyakizaka46 member"
"Riko-neechan. Actually we are good friends. She have a lot of childish aspect, but recently the number of times where i thought 'She really is a 20 yo' have increased. May it be a good year for you. I recently went out for a meal with Yui. She feels like an older sister i can reply on. "Hmmmmmmm. We looked like we are having fun. We both like this picture. "Our activities will truly begin from now on. I don't know what's going to happen, but i'll work my hardest with no intention of losing." "Kuroi Hitsuji resonates with my heart. I'll do my best as i imagine myself creating such work together with my seniors. There are many things that i must face, i'd be happy if you can warmly watch over me." Karin-chan may be the quiet future of this crew. That problem of looking different from how she feels is familiar. Frustrating for her...but she'll learn how to be an idol. Hono: I dislike food that resembles a living being. 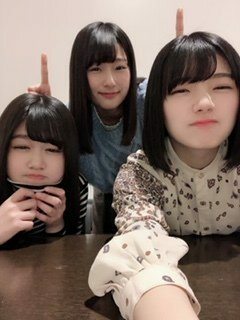 Karin: I dislike grilled eggplant, I ate too much of them during kindergarten and grew to dislike it. Riko: I dislike fish, I can't eat small living beings.